Nepenthes boschiana is an intermediate to highland growing Nepenthes. It used to be hard to get, but now is fairly available. Borneo Exotics has released large cuttings from a single clone to their distributors. I've also seen Exotica Plants have N. boschiana from cuttings available as well. I grow two clones as pictured above. Both plants do not like my winters. They grow closer to intermediates than true highlanders for me. When temperatures get into the mid to lower 40's they stop growing and suffer. 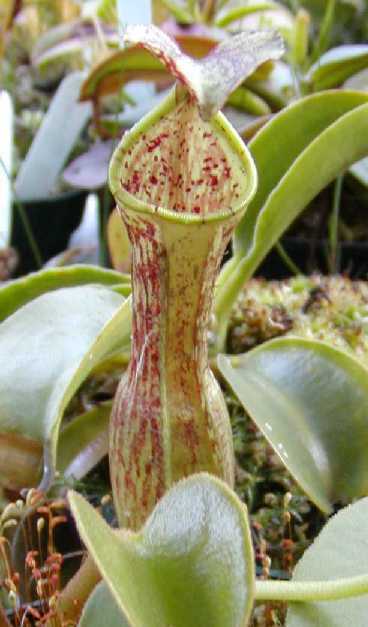 The leaves brown up on the edges and all pitcher production stops. So I have to watch them closely in winter so I don't lose any of them. I can bring them indoors and weather them for a month until daytime temperatures rise. This species has nice coloration and is easy to grow provided the temperatures don't get too low. Also, large plants up to 24" across have been available from the CP Jungle. That lowers the risk of losing a smaller plant and cuts down the length of growing time to reach adulthood. 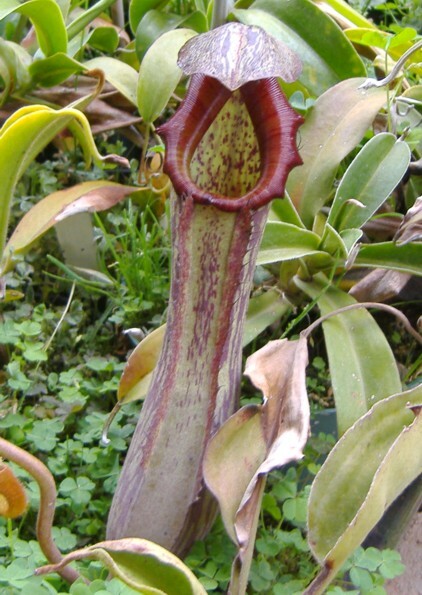 Not many Nepenthes of that size are available.